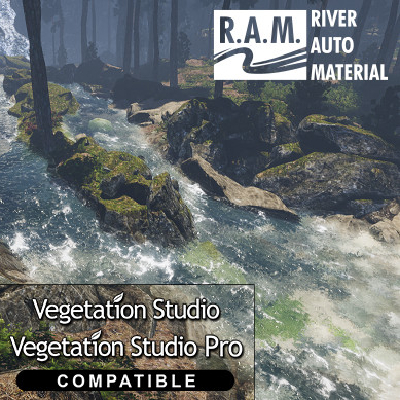 The R.A.M package gives you the ability to automatically create very advanced rivers and lakes with a map of the flow direction, shapes and textures of the river bed. The shader generates several cascade types on the slope of the grid. You simply drag the river material into the grid or you can create it using our modern spline tool with the profile system, and the flow is ready. The Spline tool can even create a simple road - see our sample images. With all the sliders and options you have full control over each river stage, you can control: reflection, smoothness, speed, normal, tessellation, foam texture, shallow water, color depth, water depth, cascades and waterfalls and much more.